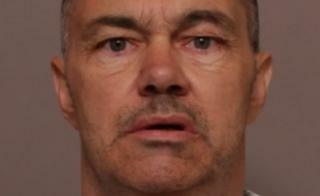 A man who slit his partner's throat on her 52nd birthday has been jailed for life for her murder. Jeremy Clarke, 55, killed Tracey Evans within 10 minutes of her arriving at their flat in Measham, Leicestershire, after a night out on 5 August. Judge Philip Head QC called the attack a "savage, brutal and pitiless killing". Clarke was found guilty at Leicester Crown Court on Monday and sentenced to at least 22 years in prison. The court heard the attack was carried out in the bathroom of their High Street flat after they had returned from a day drinking, celebrating her birthday at the Bird in Hand pub in Measham. Judge Head added: "You [Clarke] cut her throat from ear-to-ear, so deeply her tongue was nearly severed." Mr Head said the jury rejected Clarke's claim he caused her death during a hypoglycaemic episode as a result of his diabetes. Mr Head added that evidence heard in court showed that Clarke held her head while standing behind her as she crouched or kneeled, cutting her neck four times with a knife and that she must have "suffered dreadfully". He added: "No more than six-and-a-half minutes after she entered the home, you had left after killing her." The court heard Clarke called his daughter to confess, and planned to end his own life to save himself from prison. Defending, William Harbage QC said the killing was carried out in "an explosion of temper." Ms Evans' daughter, Jodie Winterson, gave an emotional victim impact statement, describing Clarke as "pure evil." She said: "Her birthday is now the day we lay flowers on her grave. "We will never recover from this. "Her death was savage. She would have been in severe pain, suffering and alone." She also told the court that Clarke made a "deceitful" call to the ambulance service, in which he told them she was still alive. Part way through the statement, she turned to speak to Clarke directly as he sat in the dock, saying: "You took the life of a beautiful woman. "She loved you and you repaid that love with brutality. "You took her away from us due to spite and your own insecurities." Clarke showed no emotion as he was led away following sentencing.